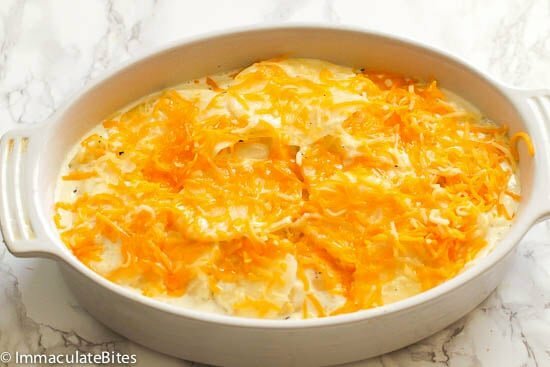 Scalloped Potatoes – cheesy, creamy dish made with round slices of potato simmered first in a flavorful cream mixture then baked to perfection with cheeses on top. The perfect side dish for your Thanksgiving spread! Creamy, flavorful and saucy! Scalloped potatoes are hands down my favorite American comfort food. When I’m feeling the blues and craving for something creamy, I like to whip this version up. 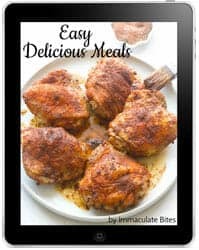 It is such a convenient food and, may I say, most of the ingredients are in your fridge or pantry anyways – no need to rush to the grocery store. This recipe has become my standard recipe for scalloped potatoes – I adapted it from Cooks Illustrated version. 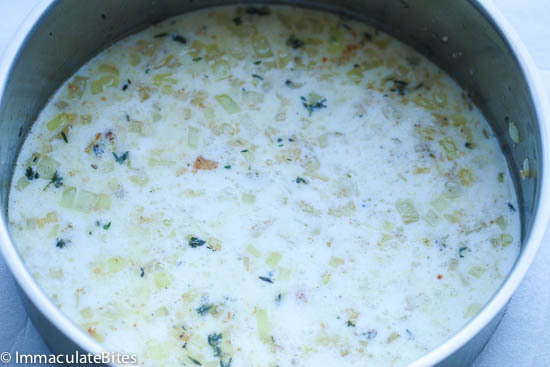 In addition to the typical ingredients onions, garlic, thyme, cream and milk, you can include bacon, if desired . 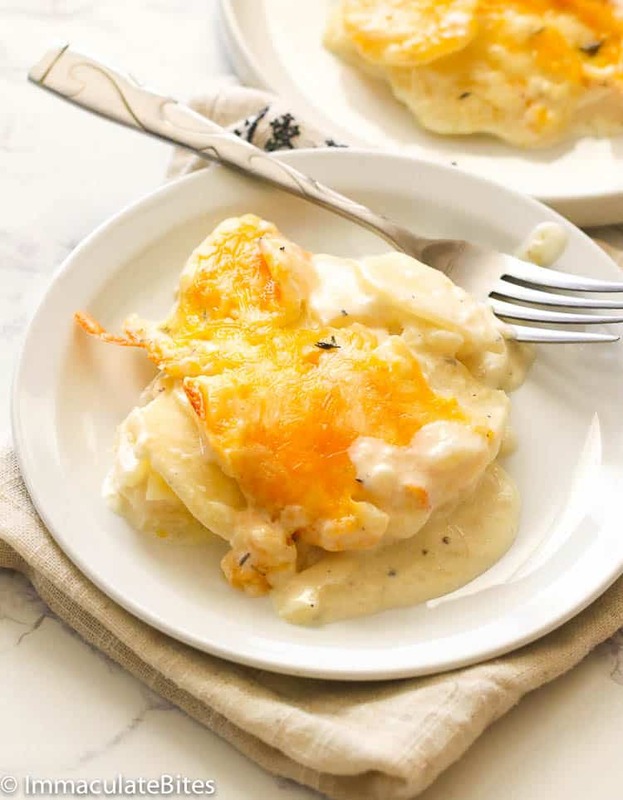 This makes for a rich, flavorful creamy scalloped potatoes that cannot be beat. Oh yeah… and top it off with cheese!! It always yields a perfect amount of ooey gooey goodness. These two seem awfully similar. In fact, most would consider them as one. They both have rounds of sliced potatoes wrapped in a creamy, rich white sauce and baked in a casserole dish. But surprisingly, there is a thin line that sets them apart. 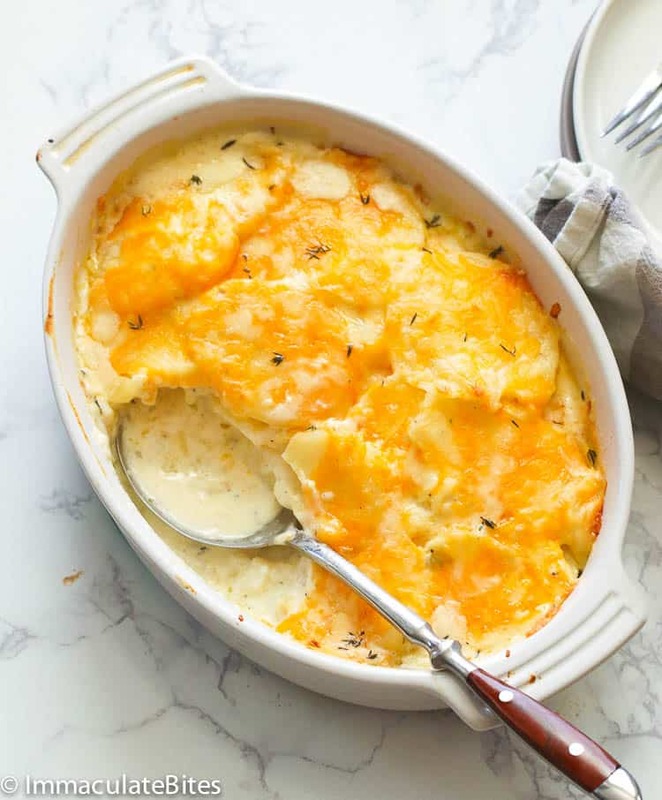 Au gratin turns out to be defined as “covered with breadcrumbs or cheese”, while scalloped potatoes is more like “bake with milk or sauce”. 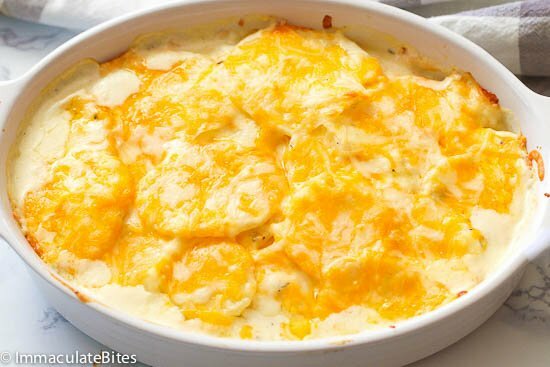 Most au gratin potatoes recipe would call for sprinkling grated cheese in between each layers and topping it with cheese and/or breadcrumbs. 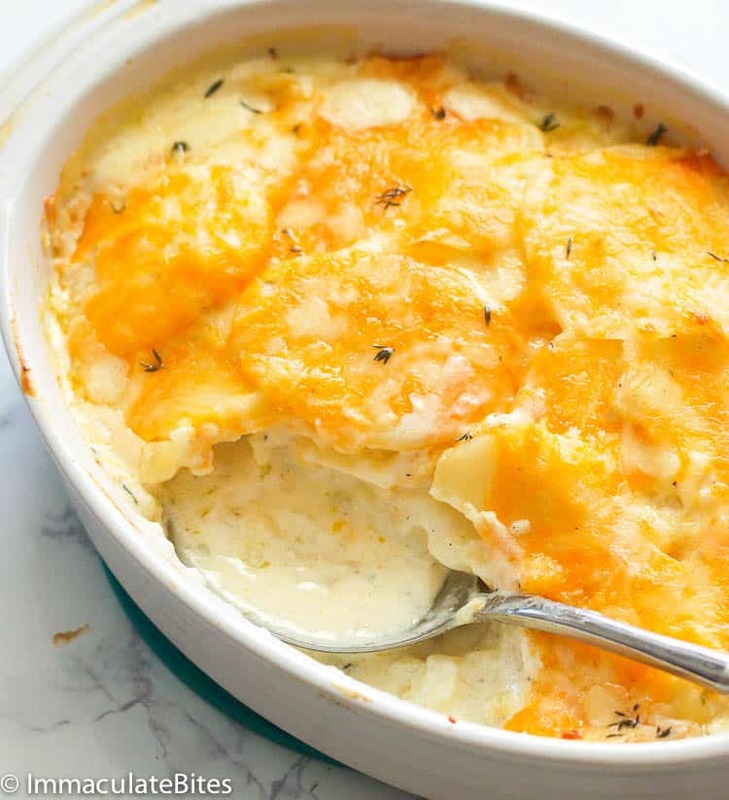 Moreover, potatoes in a scalloped potatoes are sliced thicker compared to au gratin potatoes. You can read it more of their differences HERE. What I exactly do know though is it is pure comfort food either way! I mean, how can you not fall in love with potatoes,milk and cheese?? 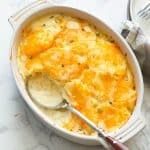 Can I make scalloped potatoes ahead? Yes, you sure can. This scalloped potatoes is a great Thanksgiving make-ahead side dish. Simply bake the dish as directed, then allow it to cool before you cover it with a foil. Refrigerate for up to three days. When ready to serve, just pop it in the oven at 350 F and bake while covered with foil for about 30 minutes. These scalloped potatoes taste great the next day, assuming you have any leftovers. I have to say that, I have absolutely no will power when it comes these potatoes. To cut down on cooking time, I use a food processor (if I am cooking for a crowd) otherwise a mandolin will do just fine. The potato slices are parboiled in the aromatic creamy sauce to cut down on the cooking time and assure evenness of cooking. I had to take the pictures over again! Sshhhh. My sister-in-law and I could not help digging in. You can’t blame us! From the toppings, potatoes, and down to that last spoon – everything is spot on delicious. I recommend that you do not use pre-shredded cheeses in this recipe as they don’t melt easily. Aside from Cheddar or Parmesan, you can also use Monterrey Jack, Gruyere or Fontina cheeses. Russet potatoes are the best choice for scalloped potatoes as they are starchy and the sauce clings well to them. Use a mandolin as much as possible to achieve even slices and even cooking. Recipe was first published on November 2016 and has been updated with new photos and write up. 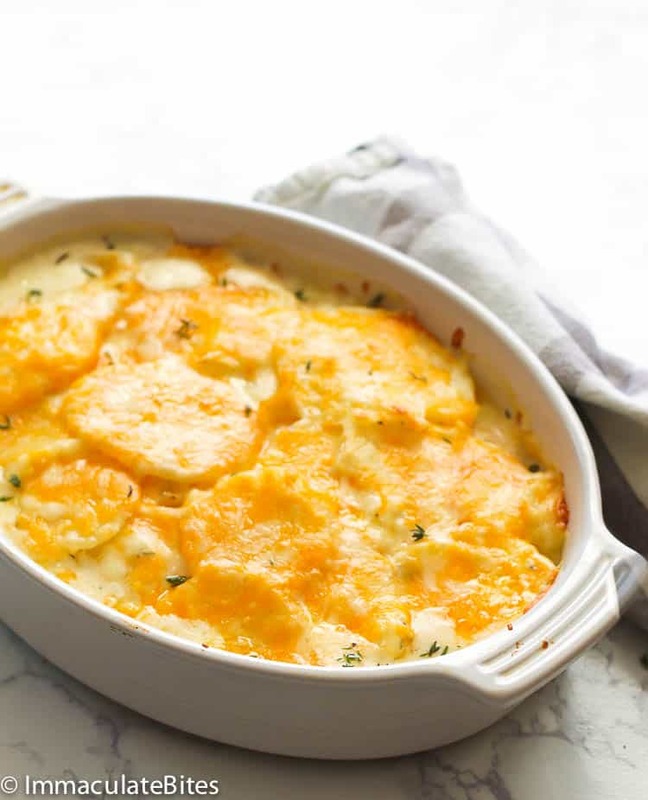 Scalloped Potatoes - cheesy, creamy dish made with round slices of potato simmered first in a flavorful cream mixture then baked to perfection with cheeses on top. The perfect side dish for your Thanksgiving spread! Creamy, flavorful and saucy! Sauté for about a minute or more until fragrant. Be careful not to let the garlic burn. 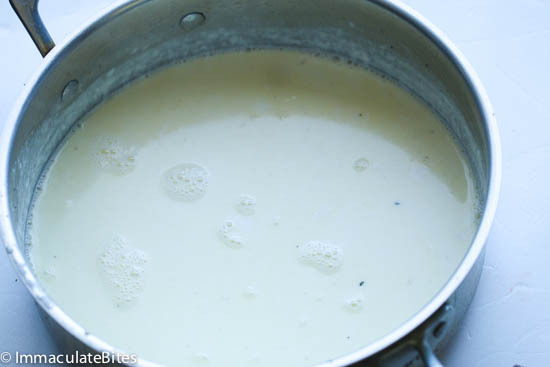 Bring to the cream mixture to a boil and simmer over medium heat, stirring occasionally for about 5 minutes. Remove from heat and let it cool down a little. Sprinkle with cheese and bacon and let it cool before serving. Sauté onions, garlic thyme with bacon fat and butter for about a minute or more until fragrant. Be careful not to let the garlic burn. Pour in cream, and milk followed by salt, pepper, and a dash of nutmeg. 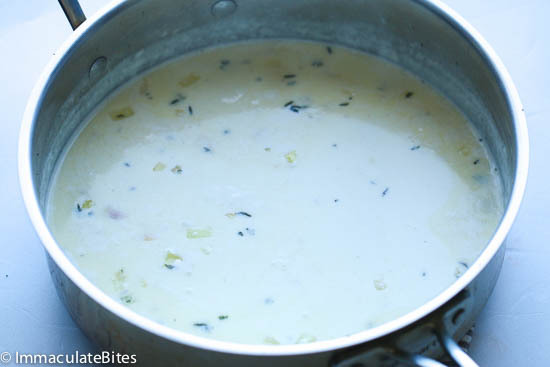 Bring to the cream mixture to a boil and simmer over medium heat. Stir occasionally for about 5 minutes. Remove from heat and let it cool down a little. 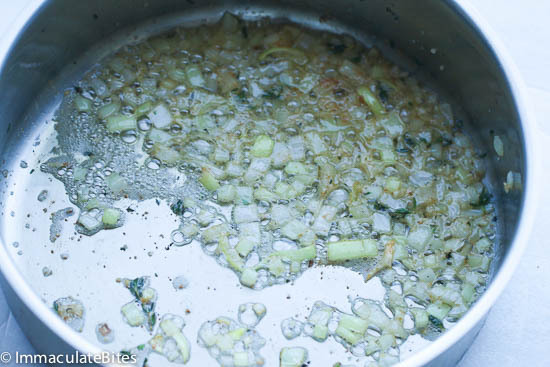 You may (optional) discard onions and thyme (use a sieve for this process). Transfer cream mixture in to a Dutch oven. 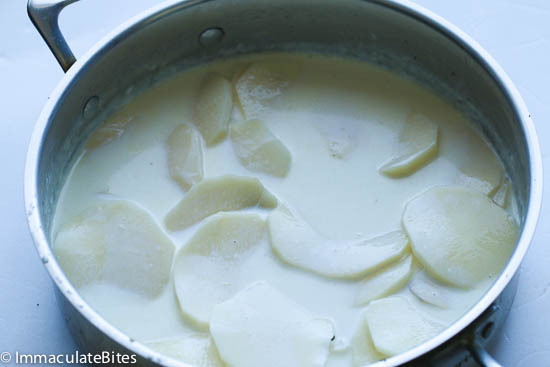 Add sliced potatoes into the creamy mixture. Cover Dutch oven adjust heat temperature to a simmer. Cook for about 10-15 minutes until potatoes is almost tender when pierced with fork. Then transfer to a baking dish, add cheese or sprinkle after baking. Bake until potato mixture is bubbling around sides and the top is golden brown. Remove and immediate sprinkle bacon (optional). Ohh I love the addition of bacon to scalloped potatoes! Perfect recipe for Easter! They are indeed. Already adding them on my menu. 🙂 Thanks for dropping by. This looks yummy!!! Can I make the potatoes without milk?? Hi Gladness, You sure can. But it would not be as creamy. My Caucasian niece married an African American/Caucasian man. He invited our family to his Grandparents home for Christmas Dinner. I’m Mexican/American and I can cook whatever. However, I want to impress his family. So thank you for posting this recipe. I will let you know how it comes out along with their comments. Wish me luck. You definitely going to impress . Am keeping my fingers crossed for you Arthur. And Wishing you all the best and a Very Merry Christmas . Happy Cooking !!! Sounds scrumptious, will definitely try it out! When is the Cook Book coming out????? My provisional recipe folder is becoming bulky from all the recipes I have printed so far. Wow! Just made these potatoes. In my mind I was at a five star restaurant. Yes, they were that scrumptious, delicious and good. Thank you so much for such tasty recipes. When is the cook book coming out?? For now I guess I have to print all the recipes and make my own. I am excited about my new way of cooking. Going to give this a try! Quick question? Do I have to sieve the milk mixture before adding the potatoes?